A Cuvier's beaked whale that washed ashore earlier this month in Donegal. Cuvier’s beaked whales are thought to be one of the deepest diving whales and typically live around deepwater canyons near the edge of the continental shelf. O’Connell said that they are seldom seen alive, with the most information about them found by examining stranded animals. Judging from events around the world, beaked whales are susceptible to death or injury due to extremely loud man-made oceanographic noise such as that produced by low and mid-frequency naval sonar and certain types of acoustic survey used to examine the sea floor and below according to the IWDG. “Mass strandings of beaked whales coincidental with naval exercises have been recorded in Greece, the Canaries and the Bahamas,” O’Connell said. While no definite cause has been established for the whales that have washed up this month, O’Connell has said that the mass strandings need to be recognised as an unusual stranding event in an effort to identify and “perhaps prevent a future reoccurrence”. “If the strandings are recognised as an unusual stranding event in Scotland it would mean that the British government will investigate the deaths, possibly from the point of view of the British Navy,” O’Connell said. Britain’s Royal Navy regularly carry out training operations using sonar while the Irish Naval service does not use sonar on its vessels during any of its activities. When previously asked about the whale strandings the Navy said in a statement that there is “no evidence that the deaths of these marine mammals have been attributed to any Royal Navy sonar operations, trials or exercises”. O’Connell said that he has emailed the Irish government regularly since the strandings started earlier this month to get it to investigate the causes of death, but he has yet to receive a reply. 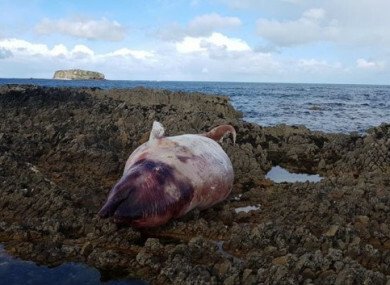 Email “Record number of dead beaked whales washed ashore in Ireland this month ”. Feedback on “Record number of dead beaked whales washed ashore in Ireland this month ”.